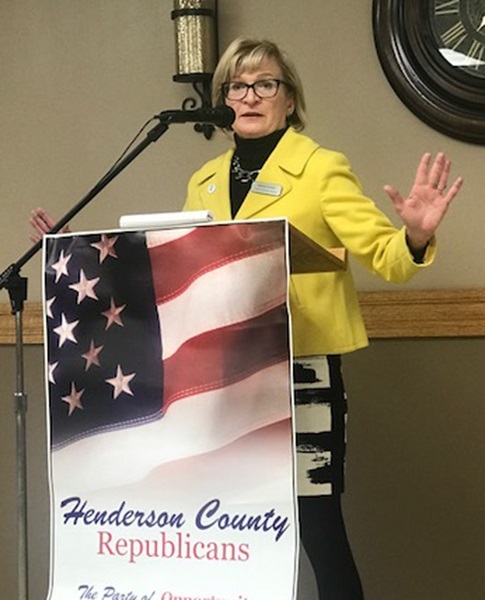 With visitors from Hancock, Knox, Warren and other nearby counties, the Henderson County Republicans had a good attendance at their Annual Lincoln Day Dinner Monday evening at St. Patrick's Community Center outside Raritan. They enjoyed socializing and visiting with candidates prior to the early meal of tender roast beef and pork that had the crowd raving over the farm fresh meal. 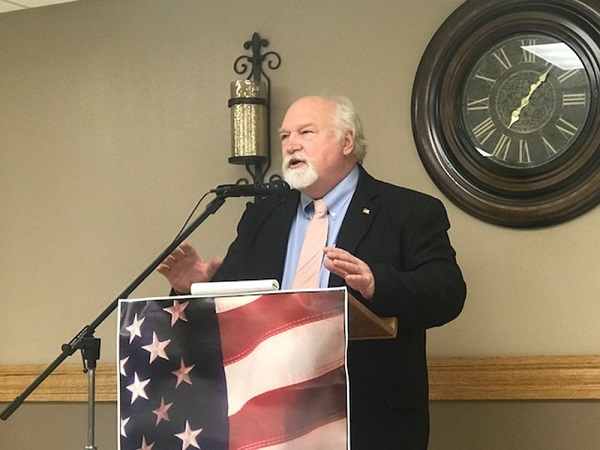 But when speakers were introduced and came to the podium, Republicans clapped and seemed even more enthused over the slate of candidates that had accepted the central committeemen's invitation to the Lincoln Day annual event. Several braved ice, snow and wind such as Bill Fawell of Galena, candidate for Representative in Congress, and Jason Helland, candidate for Secretary of State of Kankakee, and Darlene Senger of Naperville, candidate for Comptroller, and Rich Morthland of Port Byron, a candidate for Lieutenant Governor. All except Morthland are running unopposed in Illinois' Primary Election Tuesday, March 20. Jeanne Ives for Governor, of Wheaton, and Rich Morthland who lives on his family's homestead and farm that he purchased out of the family trust near Port Byron, are challenging the incumbents, Governor Bruce Rauner and Lieutenant Governor Evelyn Sanguinetti. Morthland had handed out a 40 page booklet by Chris Cleveland, Illinois Chairman of the Republican Party and "paid for by Ives for Illinois-Governor". Jeanne Ives is a "mom, a soldier, and a state legislator." The book, you may have come across in your mail: The Governor You Don't Know-The Other Side Of Bruce Rauner. Chapter 4: The Chicago Schools Bailout, Hurt Your Kids. Chapter 9: The Way Forward. Morthland told guests that "You must read this book" about your Governor. It is full of facts!" In his three minutes, Morthland says he is proud to be standing with Ives and together will work to give Illinois residents their state back and make Illinois fiscally responsible, create jobs to bring our children back home. 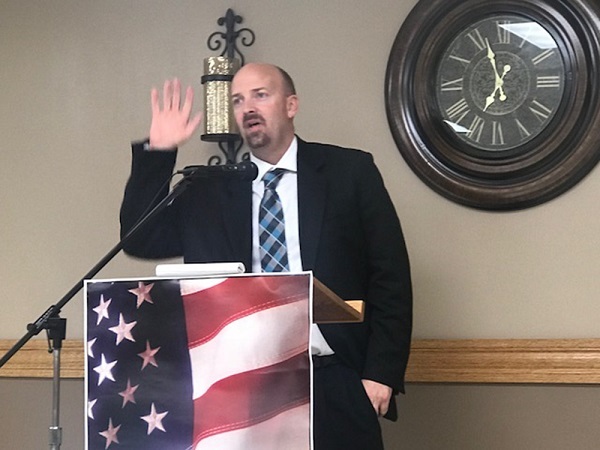 Grundy County States Attorney Jason Helland, running for Secretary of State to replace Jesse White, said Mike Madigan is the longest serving Speaker of the House in the United States and spent $63 million on his campaign this last election compared to President Trump's $66 million. Jesse White has served 5 terms, 20 years, the longest serving Secretary of State. "He controls Madigan's jobs for his team" Helland said, "and he endorses every Democrat of Madigan's." Lisa Madigan, who is Attorney General, has also served longer than any other Attorney General, he said. Helland said, he went into law enforcement in college, is now an attorney and the last two terms has served as States Attorney in Kankakee. He's a conservative, very involved in the community, coaches soccer his 3rd year for young "kids who don't listen", helps with shelters and Habitat for Humanity. "I'm tired of Chicago running our entire state." "To win," he said, "you have to go door-to-door. Good hard work beats money every time!" "We have been to 25 counties and I'm going door-to-door," he said. "We have to get this state running in a different direction." Darlene Senger of Naperville is running for Illinois Comptroller. She got her degrees in finance at Perdue and DePaul before working for the First National Bank and then SCI. She served six years on the Naperville council and now serves as Illinois Representative of the 95th District. "You're the crew that can bring us home," she said. And encouraged Illinois residents to work for the party to get out the vote and talk about the issues for Illinois. 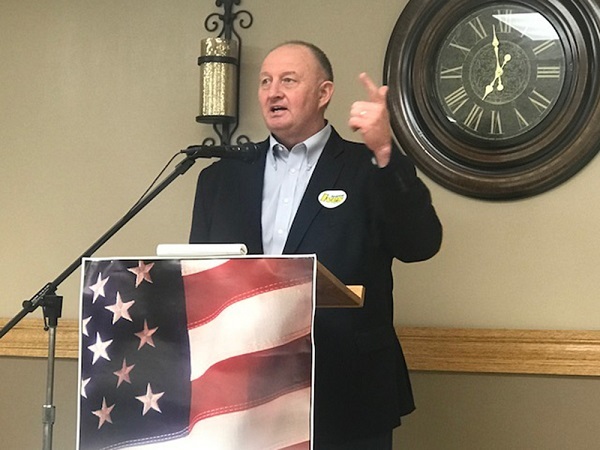 William "Bill" Fawell of Galena, is running for the 17th Representative's seat in Congress against incumbent Cheri Busto who he says has abandoned the people of the district. He address the current issue of states calling for a Constitutional Convention. The real issue isn't a convention, but "we need to live up to the Constitution we have which lays out the daily operation of a government that allows the people to rule!" Fawell said, "the Constitution is the second most important document handed down to us after the Bible." "We have the power of agencies running the government without the people's say." He feels we need to push more control back to the states, closer to the people and let them rule. "These powers have been turned over to too many agencies manipulated by lobbists." Fawell said he hopes to hear of more events and return to visit with residents. Many local candidates were present and either spoke or were introduced.